Rumors are flying around the WoW community that Cataclysm - the hotly-anticipated third expansion to the mammoth MMORPG - will be entering the secret "Friends and Family" Alpha Test Tuesday of this week. It says something about the scope and popularity of Blizzard's World of Warcraft that a rumor about a secret closed pre-beta test of an upcoming expansion for friends and family of the developers is newsworthy, but the rumor has been spreading like wildfire, so here we go: Yesterday, sources told our colleagues at WoW Insider that the "Friends and Family" Alpha Test of World of Warcraft: Cataclysm would be starting this week - specifically, Tuesday the 12th. The source also said that the alpha would not be distributed digitally, but burned to disc - admittedly, something that seems like a strange waste of time and resources, when digital distribution has worked for the previous tests in the past. While a photo of a reported Cataclysm DVD surfaced on the WoWleak Twitter, as well as a photo of a Cataclysm Authenticator, various parties were able to confirm that the DVD was a forgery - though Insider's sources stand firm that the Cataclysm alpha is imminent. It's true that there are more uncertainties and holes in these rumors than you can shake an Ashkandi, Greatsword of the Brotherhood at, but let's operate under the assumption that it's true, for the moment, and that the expansion is entering Alpha - and compare it to Wrath of the Lich King. 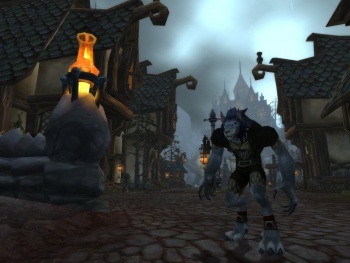 The final content patch of Burning Crusade, Patch 2.4 "Fury of the Sunwell," went live near the end of March '08, and we first heard whispers that WotLK had entered Alpha in April. Seeing as how the final WotLK raid patch, 3.3 "Fall of the Lich King," went live in early December, the timing seems right here - the Alpha starts a month after the grand finale of the previous expansion. So that lines up. Now, assuming that it will take exactly as long to test Cataclysm in both Alpha and Beta phases as it did to test Wrath (hardly an assurance given how part of Cataclysm is that it's going to be changing pretty much everything), when will the Beta start... and when will it come out? WotLK went into Alpha in April, went into Beta in July, and came out in November. Shifting everything up three months for Cataclysm, that gives us an April date for the Beta, and an August approximation for the expansion pack's release - which means that a September or October BlizzCon could be completely focused on Diablo III and the next StarCraft II episode. Obviously, this is just conjecture, though it's interesting to note that if Cataclysm did indeed come out in August, it might interfere with the equally-immense StarCraft II: Wings of Liberty. Either SC2 would have to be delayed until the tail end of '10, or it would have to come out much earlier than people are expecting, lest the two monstrous PC titles steal each others' thunder. Or, potentially, Cataclysm might be on target for a November release after all, and this is just an example of Blizzard hedging its bets and starting extra early. Then again, absolutely none of this is confirmed at all, and it's unlikely to be confirmed until we start getting some concrete Alpha leaks (if we do get any at all). It could also be a very, very elaborate hoax - that's certainly an option we can't rule out, and all of this information should be taken with a heaping helping of salt. Stay tuned for more - Cataclysm is perhaps the most-anticipated WoW expansion pack to date, so we'll be keeping you all up to speed as best as we can.